Located in the heart of Mobile's historic district the Quality Inn Downtown Historic District offers our guests well-equipped rooms with microwaves mini-fridges and free Wi-Fi plus a continental breakfast. With 122 exterior-corridor rooms this low-rise Quality Inn offers rooms with complimentary Wi-Fi microwaves mini-fridges and coffeemakers. The hotel provide a convenient hot breakfast every morning. Later on guests go swimming in the seasonal outdoor pool. There are also laundry facilities and vending machines on-site. Parking is free of charge. 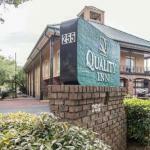 This Quality Inn is located off I-10 within a 10-minute walk of Mobile Civic Center Mobile Convention Center and the bars and restaurants on Dauphin Street. Cooper Riverside Park is about a five-minute walk. Walk the deck of a World War II battleship and tour a retired submarine at the USS Battleship Alabama Memorial Park less then 10 minutes away by car. Gulfport-Biloxi International Airport is 70 miles from the property.